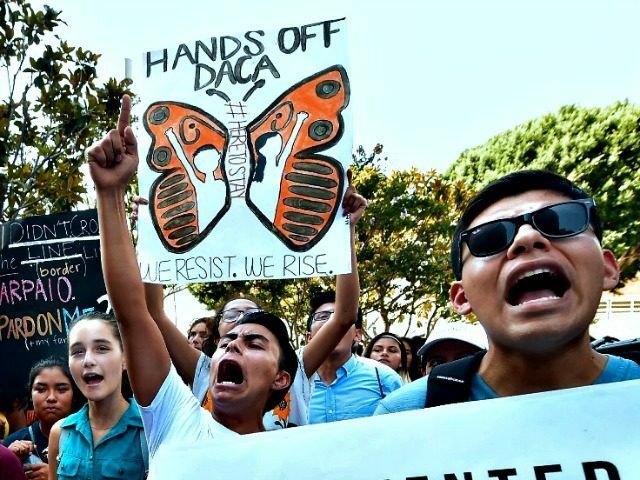 A Texas federal judge ruled on Friday that the Deferred Action for Childhood Arrivals (DACA) amnesty program for illegal aliens violates federal law, but declined the request of Texas Attorney General Ken Paxton and other states to issue an injunction blocking the program immediately, and instead certified his order for immediate appeal, fast-tracking this case for quick resolution. In a 117 page opinion, Judge Andrew Hanen of U.S. District Court for the Southern District of Texas agreed that the attorneys general, led by Paxton, were correct in their interpretation of the law — that the Obama administration’s controversial 2012 executive action violates the Administrative Procedure Act (APA) and impermissibly orders the federal government to ignore American immigration laws. Because the APA, which regulates the actions of federal agencies, was enough for him to find DACA illegal, Hanen did not address the attorneys general’s arguments based on the Take Care Clause of the U.S. Constitution. Rather than strike the program down himself with an injunction, however, Hanen left the program in place while setting up an appeal to higher courts — first the U.S. Court of Appeals for the Fifth Circuit and then, in all likelihood, the U.S. Supreme Court, where the issue of DACA’s legality will finally be decided. “We’re now very confident that DACA will soon meet the same fate as the Obama-era Deferred Action for Parents of Americans program, which the courts blocked after I led another state coalition challenging its constitutionality,” Paxton said in a statement following Hanen’s ruling. The Justice Department also weighed in. “As the Justice Department has consistently argued, DACA is an unlawful attempt to circumvent Congress, and we are pleased the court agreed today,” DOJ spokesman Devin O’Malley said in a statement. In denying the request for an injunction, Hanen points to the states’ long delay in challenging DACA. In order to secure a preliminary injunction, the attorneys general had to show that allowing DACA to continue would cause irreparable harm. While Hanen agreed with the states’ arguments as to the costs imposed by allowing DACA to continue, the fact that the states had lived under DACA for years without suing to end DACA was enough to convince Hanen that the conditions for a preliminary injunction did not exist here. Paxton and the other attorneys general held off suing over DACA for nearly six years, even as a similar coalition successfully had the Fifth Circuit strike down the functionally identical Deferred Action for Parents of Americans (DAPA) program in 2015. This delay was lengthened by the promise of the Trump administration to simply rescind DACA, which was eventually fulfilled last year. This suit was re-launched after more left-leaning courts found that President Donald Trump’s simple rescission of Obama’s DACA policies was itself likely unconstitutional. On Friday, Hanen found that the Fifth Circuit’s DAPA ruling meant that the states had a “a substantial likelihood of eventual success on the merits” in their suit against DACA. This is the standard used because of the request for an injunction to stop DACA immediately. The Fifth Circuit’s DAPA ruling was left in place with a single-sentence opinion of the Supreme Court in 2016. The Supreme Court declined to definitively rule on DAPA’s legality then, because Justice Antonin Scalia’s death left the Court without a full bench and locked in a four-to-four tie. The Supreme Court again declined to weigh in on DACA earlier this year when they had the opportunity to do so on an unusual direct appeal in a separate case before the Ninth Circuit. Hanen then certified his preliminary decision for immediate appeal to the U.S. Court of Appeals for the Fifth Circuit, effectively ending the case at his level and sending the entire matter upward toward the Supreme Court. The case is Texas v. United States, No. 1:18-cv-68 in the U.S. District Court for the Southern District of Texas. Breitbart News Senior Legal Editor Ken Klukowski contributed to this report.